There are many solar power installers in Pleasant Hill who want you to believe that the bottom line in solar power is about nothing but cost. You may believe differently, however, when a cheap “twenty-year” system does not perform as expected and the company is nowhere to be found! 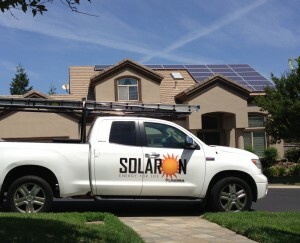 So go with Solaron in Pleasant Hill for photovoltaic panels and heating installations renowned for their quality and backed by the word of thousands of delighted property owners. Durable and efficient panels from SunPower are the only components sold by Solaron. We need our property owners to be delighted with their system, and that means constructing only the best in the technology. When you can’t wait to use your pool in the spring and you wish you didn’t have to stop swimming in the fall, you need a solar pool heating system. Solaron provides Heliocoil installations for discreet, yet effective heating in your swimming pool.